thyssenkrupp is a diversified industrial company thatemploys around 158,000 people in 79 countries. Our engineering expertise has been evolving for more than 200 years. This is why we are playing a leading role in developing innovative solutions to global challenges. 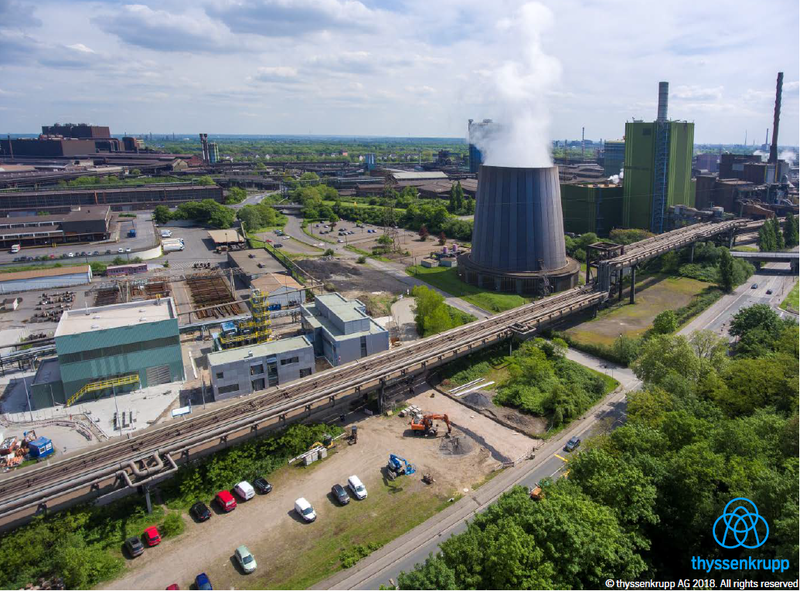 We are making the steel mill site in Duisburg home to our breakthrough project Carbon2Chem®. The construction of the pilot plant has been completed recently and will start its operation in the 2nd half of 2018. 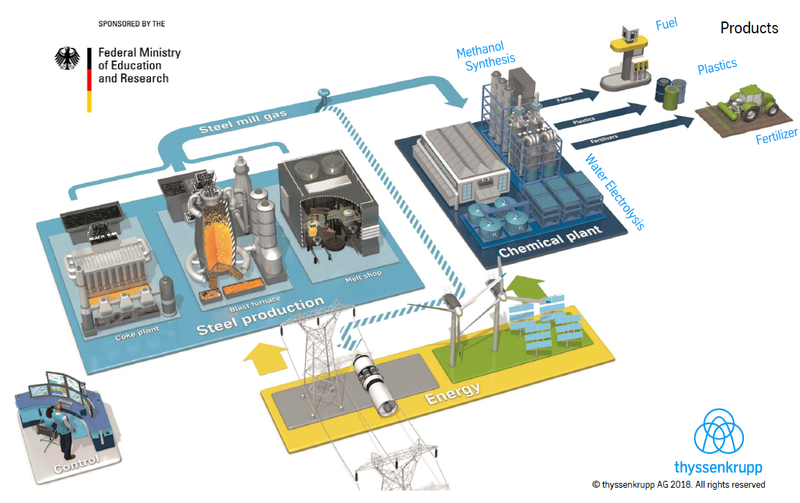 The Carbon2Chem® project aims at using emissions from steel production as raw material for chemicals. The step change is that the share of blast furnace gases in the steel production will be used for a second time in the chemical production. This cross-sectoral collaboration will deliver on both, value creation in a circular economy as well as significant CO2 savings. 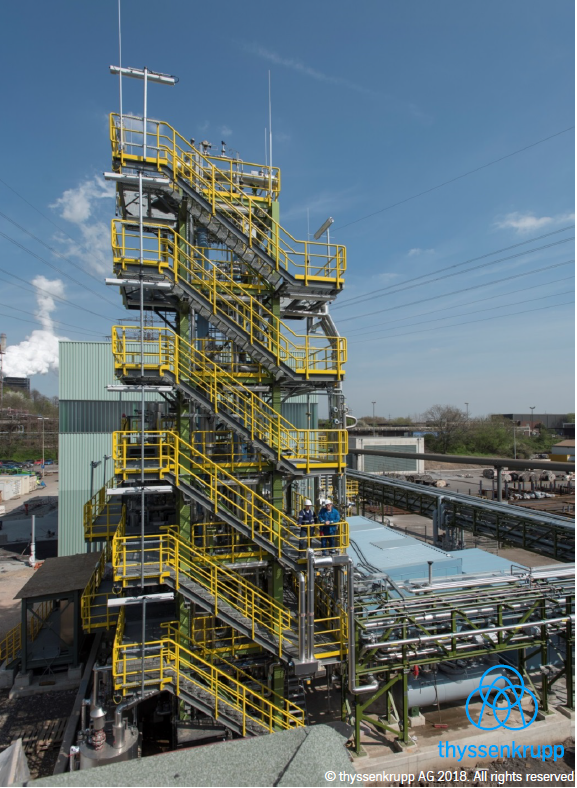 Great importance is attached to recycling in the steel industry – and has been for a long time: Since the end of the 19th century blast furnace gases have been used to generate energy for steel mills. Now for the first time we do not only want to use steel mill gases to generate electricity, we also want to produce valuable chemicals from these gases. Carbon is not only the fundamental building block of all life, it is also the most important and valuable raw material in organic chemistry. Compared to other technologies, the advantage of the Carbon2Chem® project is its cost-effectiveness as well as fossil fuels savings by replacing the conventional feedstock. Fully implemented, Carbon2Chem® can help the steel industry across Germany to reduce 20 million tonnes of CO2 emissions annually. The project can also play a vital role in the fight against climate change as the technology could be applied at around 60 steel production sites worldwide. To use steel mill gases as feedstock for chemical production we will employ hydrogen that is produced with energy from renewable sources. By using renewable energies’ surplus electricity for the Carbon2Chem® process we are keeping the volatile electricity supply in balance and secure the stability of the energy grid. Thus, the project is an essential contribution to climate protection and the transition to the low carbon economy providing jobs and growth. The implementation of Carbon2Chem® needs an adequate financial and regulatory environment to allow the realisation at commercial scale. A supportive regulatory environment is currently missing that stimulates the implementation of our low carbon technology by avoiding unnecessary regulatory hurdles and costs. The upscaling of our technology for commercialisation requires significant upfront investments in both, CAPEX and OPEX. There is the imminent need for adequate funding at national and EU level to support the upscaling especially between the stages for pilot plants (TRL 6) and commercialisation (TRL 7). The funding needs to acknowledge what measurable contributions the projects can deliver in achieving the EU’s policy goals.